Robert Redford has had a long and storied career as an actor and director, from the 60’s to the present day. But all good things must come to an end, as Redford recently announced his retirement from acting (though he has gone back and forth on that). For his swan song, he has re-teamed with indie director David Lowery after Pete’s Dragon to take on the true story of famous criminal Forrest Tucker. The result is an enjoyable, yet bittersweet experience. Taking place in 1981, Forrest Tucker (Robert Redford) is a man in his 70’s who makes a living robbing banks. However, he does it in a polite and gracious manner that earns him the respect of the people he robs. Hot on his trail is detective John Hunt (Casey Affleck), who spends his time trying catch Forrest and his accomplices Waller (Tom Waits) and Teddy (Danny Glover). Forrest also meets and strikes up a relationship with Jewell (Sissy Spacek), a widower who forms an emotional attachment to him. Forrest Tucker is certainly a likeable protagonist, but as the film progresses, you learn details about him that make you wonder if he is worth rooting for. Yet you get the sense that he does have a heart, as when interacting with Jewell, he does try to be helpful and connective. Redford, as expected, does a great job playing him. He’s extremely charismatic, but also supremely understated. He often goes through scenes barely saying more than a few lines, yet you still get a sense of his characterisation. Detective Hunt’s character acts as the perfect contrast to him and Casey Affleck’s emotionless yet also natural performance prevents him from feeling like the typical “obsessed detective”. Finally, Sissy Spacek thankfully reminds us why she is a legendary actress after spending 10 years absent from the silver screen. The storytelling manages to balance character drama and chase thriller quite well, as neither aspect outweighs the other. Though there are some contrivances in the plotting and a couple of characters feel underdeveloped, the narrative is overall very engaging. But the main themes are what ultimately enrich the script and make it feel like a personal story, focusing on time, fate, loneliness and doing what you love vs focusing on your family. These themes make the story almost a meta-commentary on Redford’s career as an actor and how he cannot keep working in the film industry, despite clearly loving it. The climax involves a series of flashbacks that I found clever and touching, getting this connection across in a very clever way. My only major issue is with the ending. Whilst it is perfect from a story and character standpoint, the message is something I am a little conflicted over. It feels like it endorses a mindset that is unintentionally egotistical and damaging, and the film overall does carry a sense of sadness that might make audiences walk away feeling depressed. Thankfully there is a lot of great humour that will distract you from this feeling, with an especially funny scene being one set in a bar bathroom towards the third act. The film is beautifully shot and directed, as Lowery brings a sense of period accurate authenticity as well as intimacy to the cinematography. The pacing is strong, as the brisk 93 minutes feel breezy yet also not rushed, though the film does sag a little with some false endings. The musical score is catchy and like Lowery’s previous films Ain’t Them Bodies Saints and A Ghost Story, the score proves that composer Daniel Hart should be hired for more films. 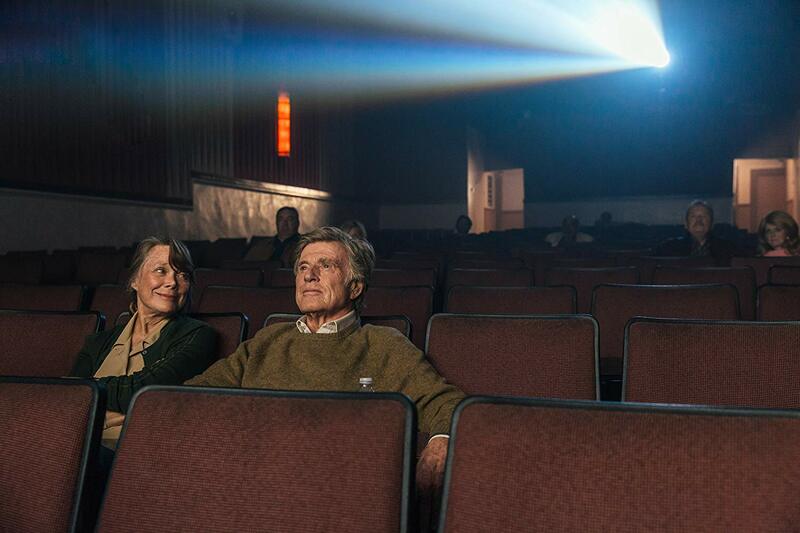 The Old Man and the Gun is a fitting conclusion to Redford’s career and an entertaining time at the cinema. It might be too depressing for some viewers, but it is enjoyable and dramatic enough to be worth watching. Even if Redford does not retire, this film acts as the perfect encapsulation of his career and personality, so it probably should be his last.